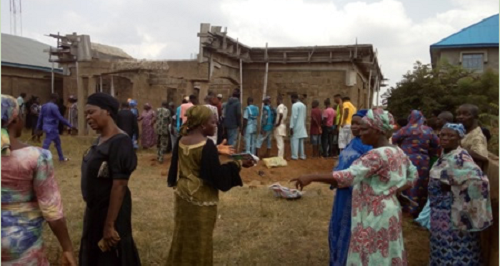 More details have emerged on the bizarre step taken by an Abuja-based RCCG Pastor who recently hired hefty men to disrupt the burial of his wife in Kwara state. Pastor Jacob Oyedepo was said to have stormed Oke Andi area of Ilorin over the weekend to chase relatives and friends of his wife of 17 years away from her burial ground. An insider said late Christiana Adetola Oyedepo allegedly borrowed money from a cooperative society and used him as co-signer. She was still servicing the loan when she died, leaving her husband and 4 children behind. The insider said immediately after her death, her relatives conspired among themselves to take over her property. After all efforts by Oyedepo to appeal to them failed, he used force to chase them off the property and seized the corpse of his wife which he took down to Abuja for a befitting burial. He has reportedly put the property up for sale so as to pay off the loan late Christiana Oyedepo borrowed from a cooperative society. Oyedepo is said to have been concerned that burying his late wife on the site would discourage prospective buyers from the property which might be eventually be taken over by her selfish relatives in Kwara state. Angered by his forceful action, the family members of late Christiana took to the social media to spread false rumour about him. Best Husband ever, Who protects his wife beyond death. Smart man.. to hell with those greedy hooligans! !